In my recent post about the bootleg Unedited Masters – Stax 1973, one of the tracks I mentioned was the overdubbed master of “Loving Arms” with backing vocals. As they sounded far too prominent, I can sympathize with producer Felton Jarvis decision to remove them. 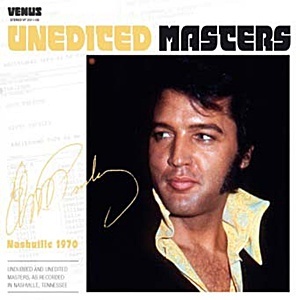 Another example of dubbing that was found to be a little over the top can be found on the companion release Unedited Masters – Nashville 1970, also by the Venus label. “Only Believe” originally featured horns, making an already unimaginative arrangement sound even worse. But apart from that one song, the rest of the album is a delight to listen to. And just like on Unedited Masters – Stax 1973, the majority of the tracks included are the complete overdubbed masters, some of them running longer than when they were originally released. At times this lends a certain song more drama, as Elvis keeps belting out the final chorus over and over, wringing out every possible emotion with his performance. “The Sound Of Your Cry” perfectly illustrates this, running for about four and a half minutes (more than a minute longer than the original single, and some 30 seconds longer than the version released on the Greatest Hits Volume 1 LP in 1981), when Elvis near the end sings “Sleep my love, as I kiss you good-bye. Then I won't hear the sound of your cry-ai-ai-ai, ai-ai-ai-ai, ai-ai-ai-ai, ai-ai-aii” in time with the beat from Jerry Carrigan's frantic drumming. Amazing stuff! So is “Twenty Days And Twenty Nights,” where Elvis effectively adds an “Oh, God” after one of the “Oh, How I miss her” lines as the song nears its conclusion, with those two words succeeding in conveying feelings of hurt and loneliness (this could also be heard on FTD's treatment of the That's The Way It Is album, but here the song goes right to the tape cut at the end while it was faded on FTD's version). Other highlights include “Got My Mojo Working/Keep Your Hands Off Of Her,” “I Washed My Hands In Muddy Water” and “Cindy, Cindy” (all three unedited and overdubbed) as well as the undubbed master of “The Fool.” Finally, I have to mention “Make The World Go Away,” where we get not only the overdubbed take 3, but also the overdubbed work part take 1 (the original master was a splice between the two, obviously after they were both overdubbed separately). For a full review of Unedited Masters – Nashville 1970, please check out Keith Flynn's excellent article over at Elvis Australia.